I started this book several years ago and quit. Not because it wasn't good. No, no, but because I was afraid of book spoilers. 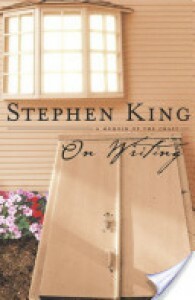 In the process of writing on his craft (writing) King discussed certain books, how he developed their plots and characters, and some of the events within them. I find all of this fascinating once I have read a book but hats knowing anything ahead of time. After several years I decided to finish the book anyway. I mean live a little, Nick! And so I have and I'm glad I did. I love most things King. As a matter of fact, Mr. King could probably read me his grocery list and hold my interest. The man just has a way of telling story. If you are interested in writing, then I highly recommend this book to you.